February | 2010 | ride.hike.eat. I have been cross country skiing a fair amount lately. It always seems that there is not enough snow to ski, but I have been lucky every time. Mendon Ponds Park is my regular place to go. The Quaker Pond loop is great! It is a safe loop to try when in doubt. Somehow there is always enough snow there. 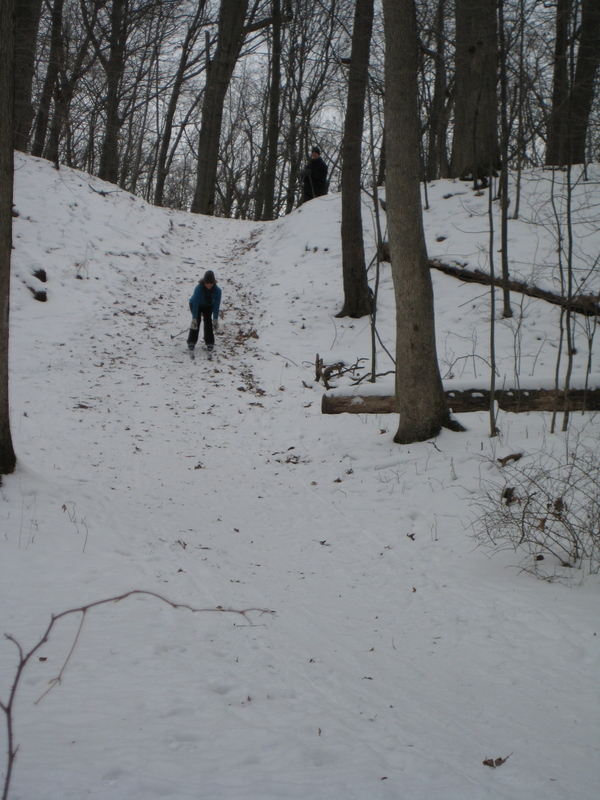 If you are looking for a more challenging loop, the East Esker loop is the “it” trail. It has lots of twisty and not so twisty ups and downs. 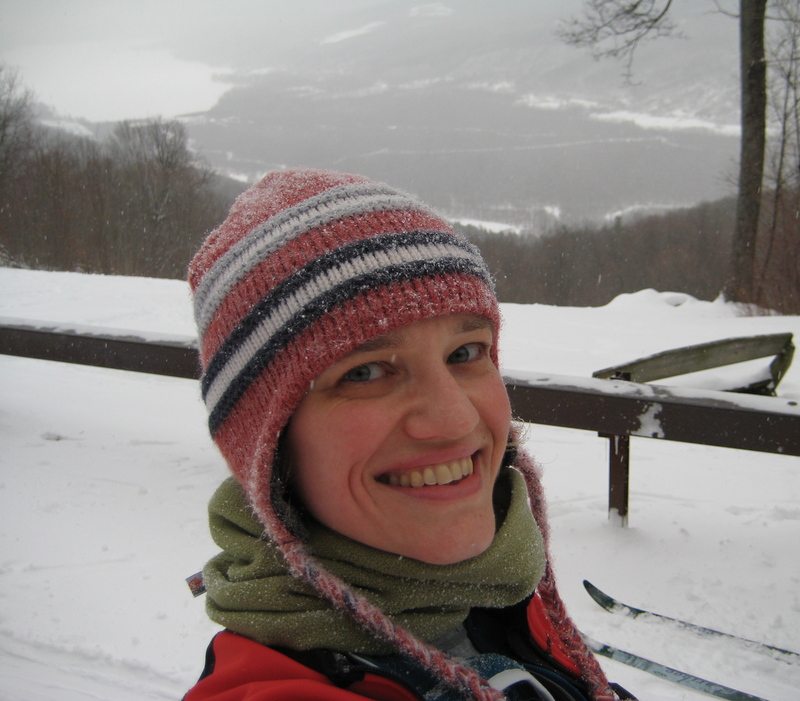 A few weekends ago, Joel and I skied that loop with Kristin and Anton. It was their first time on that loop. We had lots of fun! 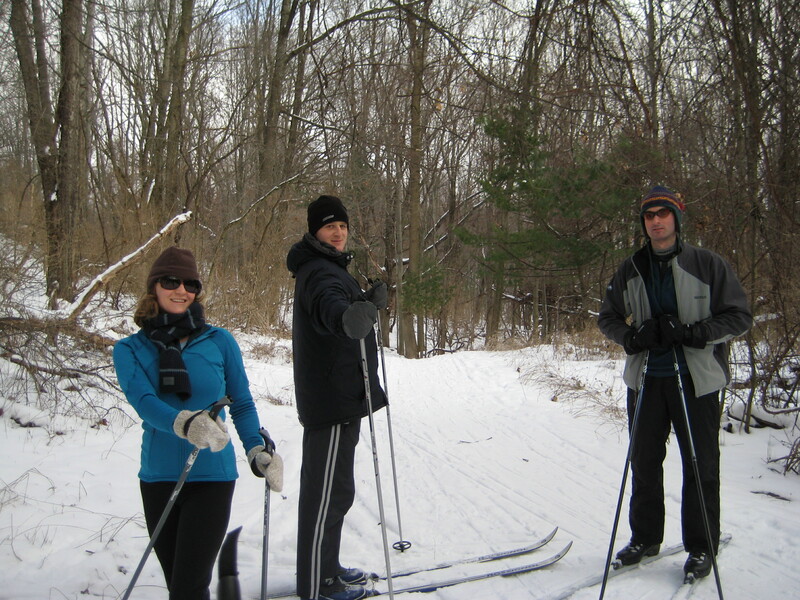 Kristin, Anton, and Joel in Mendon Ponds Park. Kristin skiing down the hill. Last weekend we met up with a few friends in Harriet Hollister. 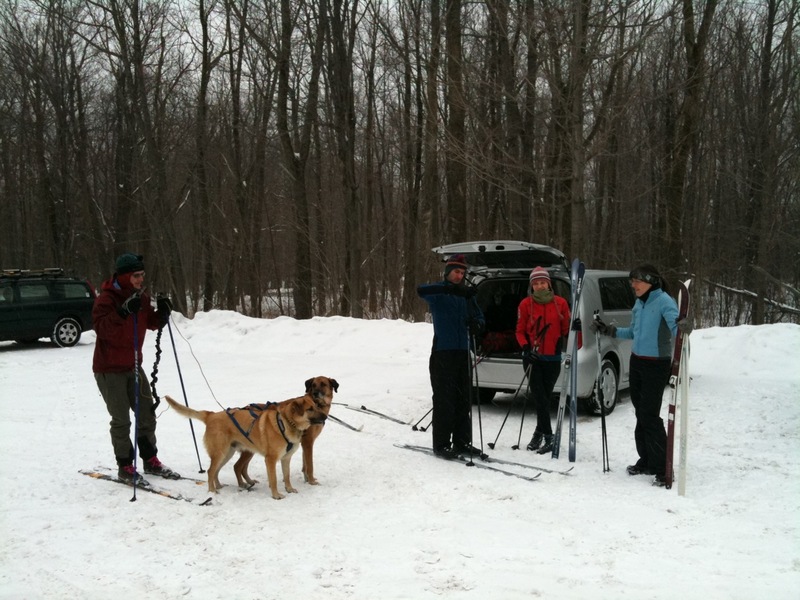 Craig, Joel, Tracy, the doggies, and I getting ready to ski. 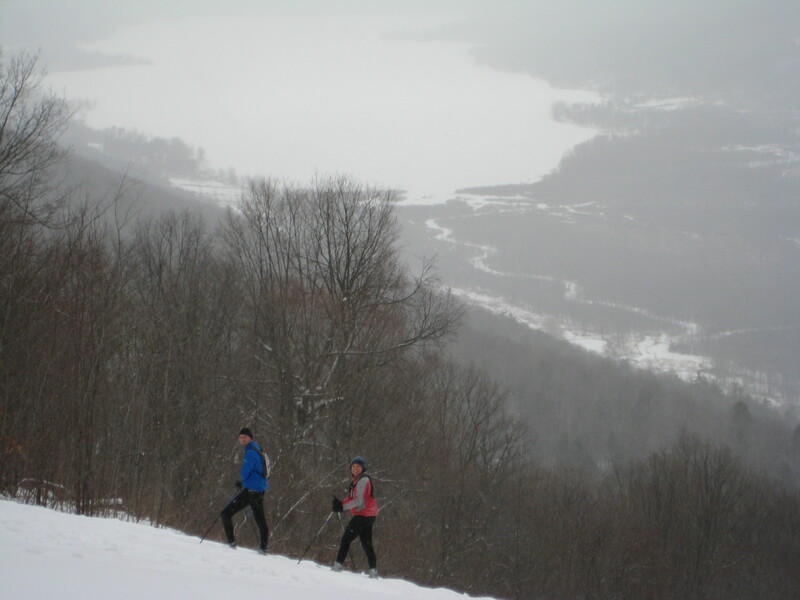 This is a great location for cross country skiing! It was my first time there. I have been there a couple of times in the summer, but never in the winter. The trails are awesome! You truly are in the woods and there are a few twisty and not so twisty ups and downs. Also, there is this incredible view of Honeoye Lake!! Michelle and Dan on a trail by the ridge. I will have to go there more often. Another thing to look forward to when going to Harriet Hollister is this great cafe called Mill Creek Cafe located on the main street in Honeoye. They have some very tasty sandwiches and home made chips. I was thinking about eating there the entire time we were skiing. Unfortunately, they are not open on Sundays during the winter. :( I guess I will just have to go there on a Saturday instead. Breakfast on weekends is one of my favorite meals. I usually have oatmeal for breakfast during the week, so on weekends I like to fancy it up. :) Joel and I have a ritual where every Saturday or Sunday we go out for breakfast. We usually end up at Jines, and I always order the same thing – waffles with pecans and real maple syrup. Real maple syrup is a must!! I do make breakfast at home too, of course. I have made crepes (of course!! ), French toast, eggs, and waffles. I despise cleaning the waffle maker, so I don’t make waffles very often. 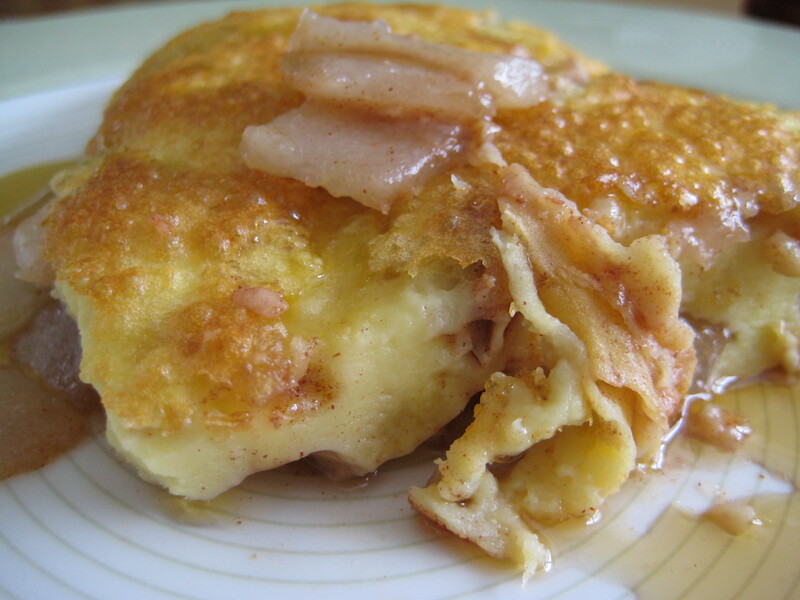 A long time ago (in 2001 to be exact), I found a delicious recipe for an Apple Puff Pancake in the Wegmans Menu Magazine. It was a keeper! I have made it numerous times since then. One day I used pears instead of apples and I loved it! I think that it works better with the pears, so I have used them ever since. I have also added some pecans, which makes it even more delicious. Last weekend, our friends Kristin and Anton invited us over for breakfast. Kristin mentioned that she was making pumpkin pancakes. YUM! For some reason, I don’t ever make pancakes. I have made them a couple of times, but they just did not excite me very much. Perhaps I did not have the best recipe. The pancakes that Kristin made were another story. They were just delicious!! They were fluffy and the pumpkin really made the dish. 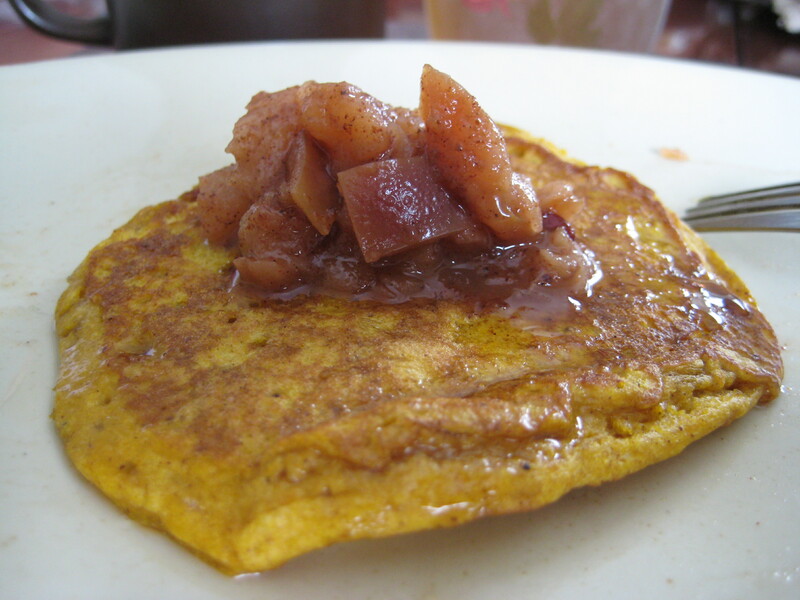 She also sautéed a few apples with some spices to use as a topping. The breakfast was delicious! I will definitely ask her for the recipe. A few weeks ago we were invited to a dinner party. I volunteered to bring a dessert. 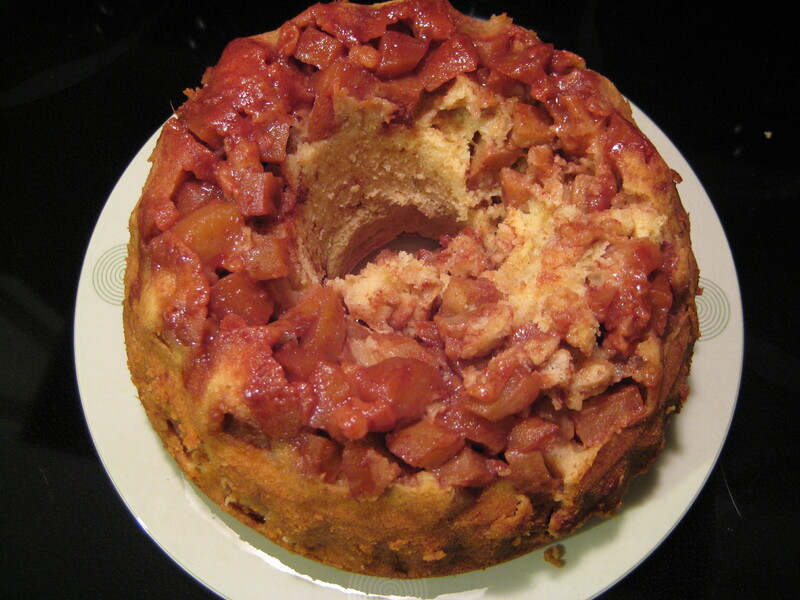 I was not sure what to make, so while searching for recipes, I came across a recipe called Mom’s Apple Cake on Smitten Kitchen. The cake was delicious! It was very moist and it had the consistency of a coffee cake. It would be a great cake to make for a brunch. The cake is supposed to be made in a tube pan and you are supposed to layer the apples with the cake batter. I don’t have a tube pan, so I made it in a bundt pan instead. It worked just as well. I also think that it can be made in a deeper square pan, if you don’t have a tube or bundt pan. Also, the recipe requires a cup of oil and 2 cups of sugar, which is unnecessary. I used a 1/2 of a cup of oil and 1 cup of sugar, and it was tasty. The cake is even better the next day. Another favorite breakfast dish (for me at least) is eggs with feta with a side of fresh bread and a pickle. But not just any pickle. You have to get the pickles from the Russian store, Europa Deli, located near Panorama Plaza in Penfield. If you do go there, you have to ask for the pickles from the bucket. They will know what you are referring to. :) I know what you are thinking… pickle with eggs? Really?? (Joel agrees with you.) What can I say… I think that it really works. :) It reminds me of my childhood. My dad used to make eggs for us all the time and we always had home made pickles with them. The fresh bread is also a must!! The eggs are simple – you just scramble them and then add some feta, salt, and a dash of vinegar. The vinegar makes them a little fluffy and adds a subtle interesting flavor. I can’t really describe it but it is tasty. One last thing that I would like to mention. 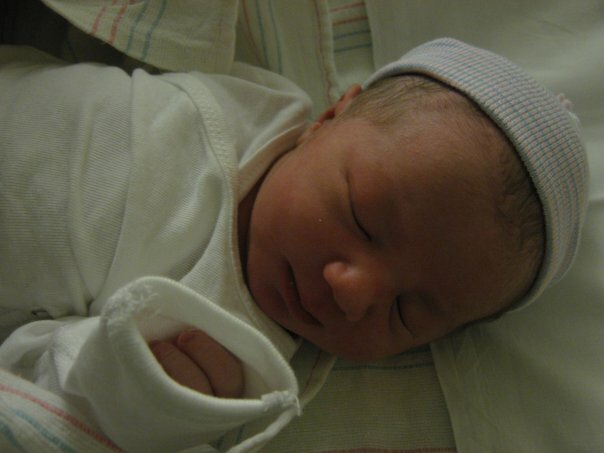 Last week, February 5th to be exact, my nephew Jack was born!